IP spoofing, also known as IP address forgery or a host file hijack, is a hijacking technique in which a cracker masquerades as a trusted host to conceal his identity, spoof a Web site, hijack browsers, or gain access to a network. We use various methods to spoof our IP addresses, most common being using Proxy, VPN and TOR. I found this interesting tool named Anonsurf and it will anonymize the entire system under TOR using IPTables. It will also allow you to start and stop i2p as well. That means you can browse anonymously in Kali Linux with Anonsurf running in the background. Anonsurf will run and keep changing IP address every so often or you can simply restart the process to make it grab a new IP address and thus spoofing your own IP address. Sounds good? Und3rf10w forked ParrotSec’s git and made a version for Kali Linux which is very easy and straight forward to install. His repo contains the sources of both the anonsurf and pandora packages from ParrotSec combined into one. Und3rf10w also made some small modifications to the DNS servers to use of Private Internet Access (instead of using FrozenDNS) and added some fixes for users who don’t use the resolvconf application. He also removed some functionality such as the GUI and IceWeasel/Firefox in RAM. There’s a installer script which makes it really easy to install it. You can review the installer script to find out more. This forked version should now work with any Debian or Ubuntu system, but this has only been tested to work on a kali-rolling amd64 system. I am also using the same system but users are advised to test and verify it in their own distro. If it works, then you will be able to hide your IP and gain anonymity as long you’re not signed into any website such as Google, Yahoo etc. I wrote a nice long article comparing different methods i.e. TOR vs VPN vs Proxy on top of each other. Anonsurf will anonymize the entire system under TOR using IPTables. It will also allow you to start and stop i2p as well. NOTE: This will clear the entire system cache, including active SSH tunnels or sessions so perhaps not a good idea to run it while working. It makes the system freeze for sometime (I tried it in a VM). remote: Counting objects: 275, done. Receiving objects: 100% (275/275), 163.44 KiB | 75.00 KiB/s, done. 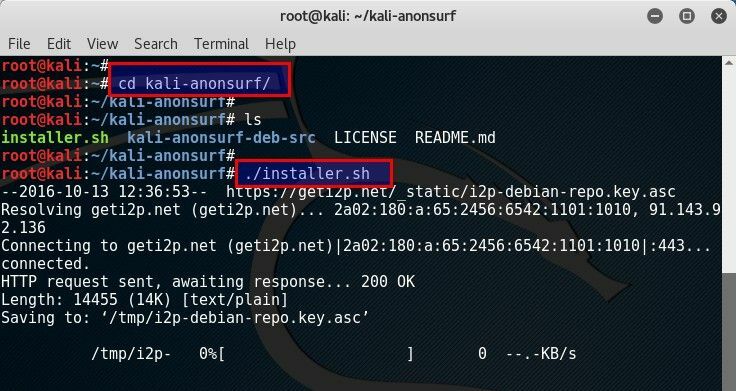 With the installer script, it’s very straight forward to install anonsurf in Kali Linux. Connecting to geti2p.net (geti2p.net)|2a02:180:a:65:2456:6542:1101:1010|:443... connected. echo -e " $GREEN*$BLUE Modified resolv.conf to use Tor and Private Internet Access DNS"
First of all, your IP address definitely changed, so there’s no worry on that side. I checked my public IP from command line, using Google and WhatismyIP. This seems to be working and I was able to browse and compared to just TOR, I think it was slightly faster and more responsive.If you think it’s working slow, simply restart anonsurf and chances are you will end up in a faster connection. The not so obvious thing people doesn’t check is if they are leaking DNS. I usually do it from http://dnsleak.com/ as shown on my post from setting up VPN. However, I did not get any results back, so I used https://www.perfect-privacy.com/dns-leaktest/ and https://torguard.net/vpn-dns-leak-test.php and they seems to think I am in Netherlands or Belgium … so all good. Those who doesn’t know what ParrotSec OS is, it is another Security OS similar to Kali Linux developed by Parrot Security. I would give them a go if I were you. Finally I would like to thank ParrotSec and Und3rf10w for taking their time and doing it. I am sure many users around the world would like to use it, specially when your country doesn’t allow access to certain Internet resources. In case ip spoofing in Kali Linux is a requirement for you, try torsocks. It uses SOCKS proxy which is not commonly used, so chances are you will have fast browsing experiences compared to standard TOR settings. 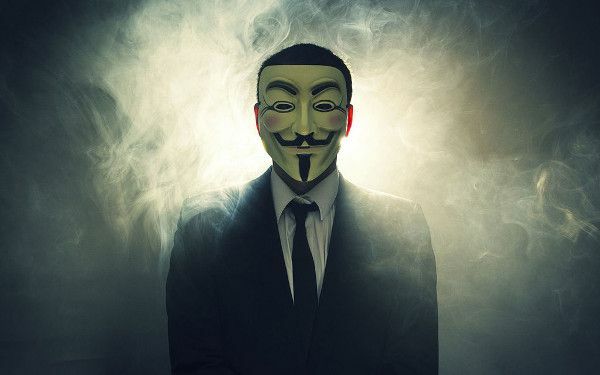 I think I covered most of anonsurf and browsing anonymously part well. Did I make any mistakes? Do you have a suggestion? Let me know. Comments section is open as always and doesn’t require registration or any validation… so do help others and contribute where applicable. thanks bro for your honestly.jys only say god helpe you and so so so merci. thank you bro u are best hahaha its working bro can u send me ur email address?